The new place of meeting of God and Man is the towering Cross where God receives and welcomes us, judges us, forgives us, recreates and saves us. This symbol is represented in the central panel of the stained glass memorial window of the Mendocino Presbyterian Church. INRI was the sign placed on the cross meaning “Jesus Christ King of the Jews”. The cross is depicted at the moment when Christ died upon the cross. The veil in the Temple of the Holy of Holies was torn from top to bottom, giving man access through Christ to God. The rent veil is depicted by a border made with bits of old glass from various sources: the former window, remnants from local persons’ windows, and old painted pieces – all suggesting the continuity of history. The left and right side panels respectively portray the Old and New Testaments which were separated by the Crucifixion. On the left are the roughly hewn tables of the Ten Commandments brought down from Mt. Sinai by Moses. Clouds hovering above represent the presence of God. At the top of the panel is a wheel from Elijah’s chariot of fire in which he ascended and disappeared heavenward. Clouds in the middle portion are leading the people of the Exodus by day through the wilderness on their way to the Promised Land of Canaan. The panel on the right portrays the hand of God reaching out to man. The dove symbolizes the Holy Spirit. At the top the shell represents baptism with water as it drops down the window. Creativity belongs to God alone. We thank Him for this gift of Grace, asking that He will use the beauty of this window to bless all who view it, those who have given, those who have been remembered, and those who have been honored. The entry stained glass window installed in 1981 in memory of Ruth Carlson has a bouquet representing different facets of Christian life. The wavy line to the rainbow is man’s wavering path. The Iris window on the left, representing the crucifixion of Christ, was installed in 1982. 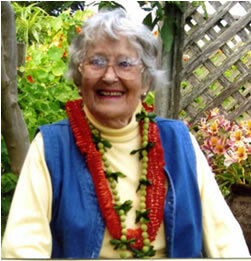 It is in memory of Margaret Josephine Huber Owen, born in 1896, the mother of Nita Pillsbury. The iris represents Mary, mother of Jesus. The flower is a symbol of the annunciation. The sword shaped leaves represent sorrows that pierce the heart as described in Simeon’s prophecy to Mary in Luke 2:34-35. The window on the right was also installed in 1982. The Fruits of the Spirit, depicted by the lowly violets, represent meek and humble. The window is in memory of Max Thelan’s grandmother, Emma Hargrave Muir, who was born in Mendocino in 1859. Old Testament: The tablets of the Ten Commandments are resting on the mountain. The tablets are rough-hewn stone; the lettering is a combination of several ancient alphabets (some imaginary) because no one knows what language God used. Elijah is symbolized by the flaming wheel of his chariot, which conveyed him to heaven upon his death. New Testament: The Hand of God is the oldest symbol of God the Father. It represents the baptism of Christ as God reaching through the clouds and acknowledges His blessing. Rays of light accompany it, as does the descending dove, symbolizing the presence of the Holy Spirit. The scallop shell, with its few drops of water, is a symbol of the baptism. Leone is a member of the Mendocino Presbyterian Church, a Session Member, a Worship Committee member in charge of Art, and was on the recent Pastor Nominating Committee. She is a staunch advocate for the important role that aesthetics of the arts play in the enhancement and power propagated by the visual arts. 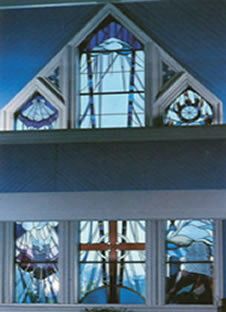 Leone designed all of the Mendocino Presbyterian Church’s stained glass. The symbolism in each piece is weighted with the Spirituality of the biblical stories and coordinated with aesthetics that empower their presence as well as being pleasing to the eye.